New thermal energy storage tanks at ‘The Well’ development will provide year-round, low-carbon cooling and heating services to Toronto’s downtown west. 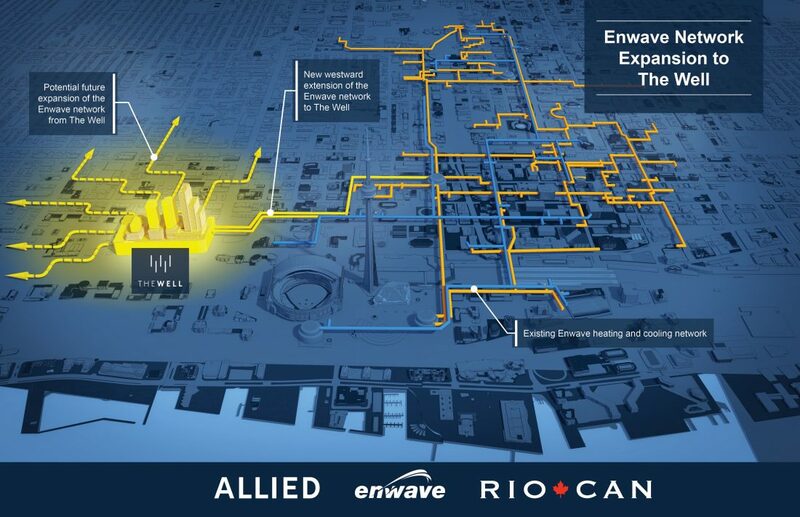 Allied Properties REIT (“Allied”) (TSX: AP.UN), Enwave Energy Corporation (“Enwave”) and RioCan REIT (“RioCan”) (TSX: REI.UN) are joining forces to extend Enwave’s existing Deep Lake Water Cooling and hot water distribution networks by building a new energy storage facility housed at The Well. The Well is a mixed-use residential, commercial and retail development by RioCan and Allied located in Toronto’s downtown west. This joint undertaking will enable westward expansion of Enwave’s system, providing both The Well and surrounding communities with access to sustainable cooling and heating solutions. This collaboration is the first one of its kind in Canada and the long-term business agreement will deliver value far into the future. The thermal energy storage facility consists of two 6-million-litre tanks underneath The Well. The tanks will store temperature-controlled water fed by Enwave’s existing Deep Lake Water Cooling system and a newly developed high-efficiency hot water network. It will expand the existing system’s capacity with the ability to serve over 20 million square feet of commercial, retail and residential space. 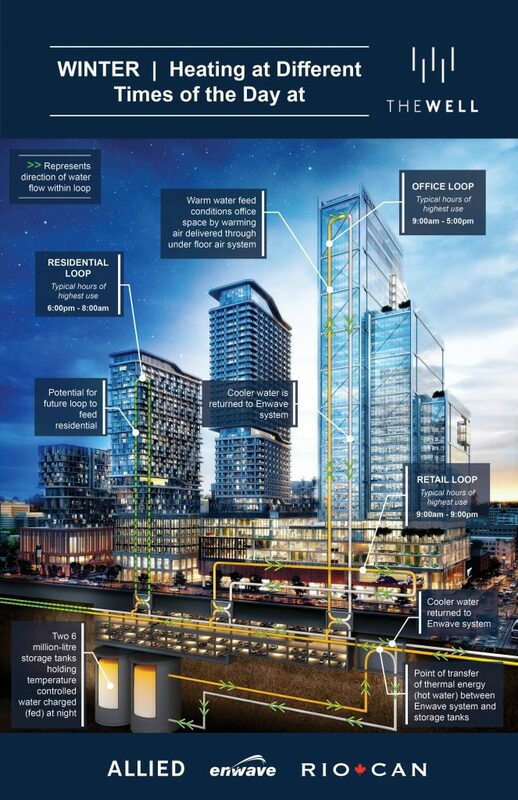 As an anchor site, the installation will serve The Well community, and buildings in neighbouring areas, providing the first low-carbon, resilient cooling and heating option for the downtown west community. This project will provide long-term benefits for the City of Toronto and support its focus on resiliency and carbon emission reduction. By decentralizing energy supply and reducing the load on the electricity grid, particularly during periods of peak demand, it enables a more reliable and flexible source of energy. The Well features 1.1 million square feet of office space, 500,000 square feet of retail and food service space, and 1,800 residential units. Construction on The Well has commenced in 2017. Two large storage tanks constructed underneath The Well will store thermal energy in water that is pumped through a network of underground pipes connected to Enwave’s existing system. Thermal energy will be distributed and stored during off-peak times (i.e. overnight) and conserved so it can be easily and quickly deployed when it’s needed. This reduces the burden of cooling and heating on the energy grid, particularly during periods of peak demand. 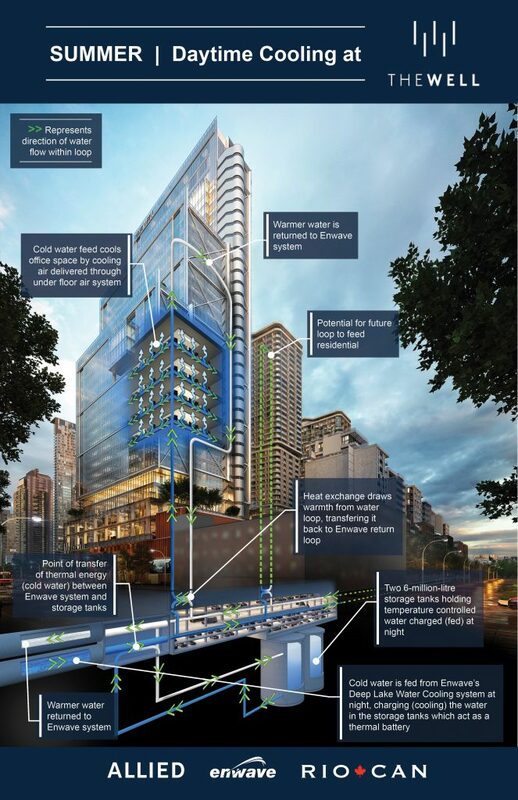 The Well enables a major westward expansion of Enwave’s heating and cooling network and will increase the existing system’s capacity with the ability to serve over 20 million square feet of commercial, retail and residential space. Much of this new capacity will serve The Well’s tenants, while the additional capacity will enable The Well to act as an anchor site for further neighbourhood growth.